The Atlanta Hawks won for the 12th time in 13 games, beating the Houston Rockets on the road 104-97 thanks to a bad shooting night from James Harden and his teammates, while Kyle Korver made the most of every opportunity he had. Playing more of a point guard role and staying away from the scoring isn’t such a bad idea, especially when you end up having 14 assists. But when so many balls go through James Harden and his ability to put the ball in the basket on his own, or the Rockets hardly having any plays to run for him off the ball, it becomes a problem, especially on such a bad shooting night from someone who less than a week ago was discussed as the leading candidate to win the MVP. 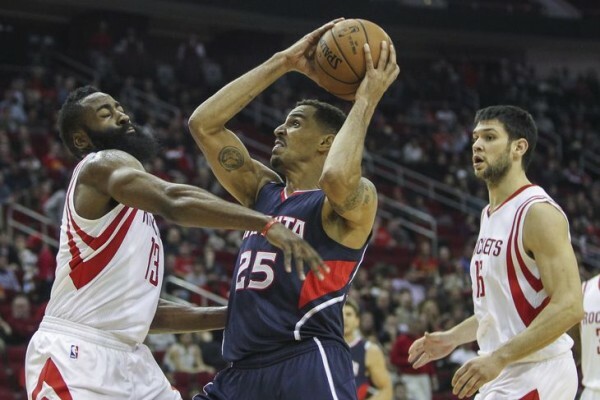 Harden shot just 5-of-16 from the field and has made only 33.3% of his attempts over the last two games. He kept finding open shooters in the fourth quarter, but the Rockets were chasing, and with the Hawks realizing Harden wasn’t going to try and do anything on his own, maybe the most important dimension of the Rockets’ offense was taken away. Harden was limited to six-of-six from the line, and Houston usually need him to do a bit more when it comes to attacking the basket. The Hawks continue to show that they’re for real. Kyle Korver scored 22 points, hitting four 3-pointers, bouncing back from scoring just four points in his previous game. Dennis Schroeder might not be as difficult to stop as Jeff Teague is, but 8 points and six assists from the German point guard were more than enough as he continues to do a very good job in filling in for the injured starter. The Hawks also had a very good day in the paint, defensively, finishing with nine blocks, three for Millsap and Horford. The Rockets without having the ease of scoring in the paint simply aren’t the same team. They made only 39.5% of their field goals with Donatas Motiejunas, Trevor Ariza, Jason Terry and Patrick Beverley all shooting quite poorly and trying a bit too much to make things happen from the outside. Dwight Howard himself was difficult to stop, scoring 19 points with 70% from the field and an even rarer 83.3% from the line. However, he was often alone in his battles inside, resulting in the relative ease for the Hawks to somewhat have the edge in the paint. The Rockets are still waiting for their lineup to be complete, missing Terrence Jones for quite some time. Their backup point guard situation keeps changing and aside from four of his players in the lineup, Kevin McHale is once again having trouble stabilizing his rotation. The critcisms of his handling style will creep back up if the Rockets don’t bounce back and join the leading pack in the West. For that kind of challenge they acquired Corey Brewer and Alexey Shved. However, the two of them were unable to play because of Troy Daniels not completing his physical with his new team. Both Brewer and Shved seem to be quite excited joining a playoff contender after playing for bottom feeders to start the season. It remains to be seen if they can elevate them from the middle of the pack into a higher echelon.